If this year’s Cinequest Opening Night festivities with the William H. Macy film, Krystal got off to a more softer start than previous Opening Night situations, the second night was set up to be an edgier affair due thanks to one name you know well. Cage. No, not Luke Cage, not Johnny Cage (or John Cage for that matter, though he was inspired by the comic book character and the actor.) But the real life actor, or “feeler” as he likes to now call himself, Nicolas Cage. Known these days for taking roles of varying shades and facets, Cage is all over the place doing everything that speaks to him from large films to smaller, more independent fare. This year, he is being honored at Cinequest as one of the several Maverick Spirit Award winners. Let’s just say, if there ever was a maverick of an actor, Cage would certainly qualify. Especially when considering his reputation as the “strange guy” who seems to go over the top in his more recent roles. When asked whether he considered himself to be a Maverick at the top of the conversation, Cage responded with, “If by Maverick, you mean, some who encourages the independent spirit in others and also in myself, I would say yes. I've always tried to encourage my costars to be independently minded.” Cage cited Prince as one of his heroes, his Maverick. You can believe that anyone who sees Prince as a Maverick has something worth hearing about. The event highlighting Cage and his career, began with a brief introduction and a 10-minute montage of highlights from the various motion pictures he has been a part of, followed by a discussion that was very insightful and revealed another side of Cage that people seem to forget: a human one. There is a sense of normalcy on display of someone who isn’t as weird and out there as many seem to think, particularly if that thinking is based on some of the weird and out there characters he has played. He is just a fun guy who happens to be well-read (of both classics and comics), who is also a genuine film aficionado and an artist who respects his craft and yet isn’t afraid to try new things and ‘develop new muscles’ in that craft. 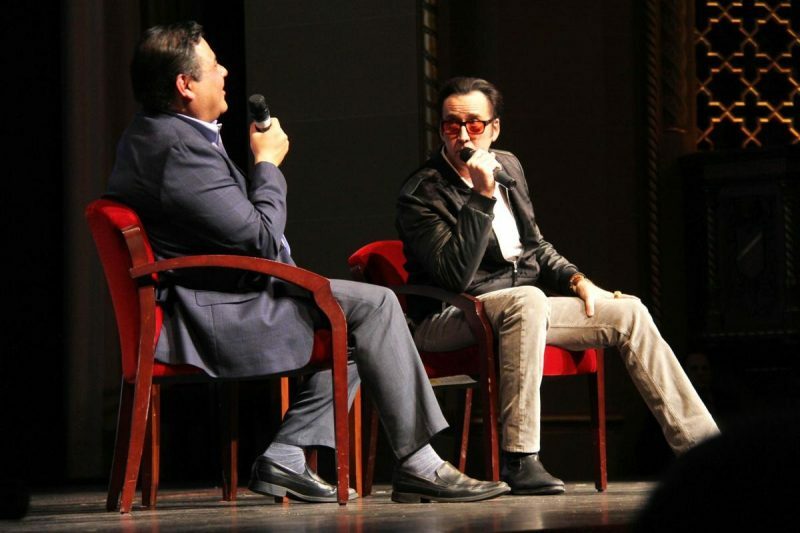 Cage was at the event to discuss his new endeavor, The Humanity Bureau, which premieres during the festival. The film is about a government agency formed to decide who gets to be included in the “safe zone” following devastating events resulting from global warming. However, what is fresh about this film is that also has a VR component which is displayed in the VR revolutions version of the film, which will also premiere at the festival. A few key people behind the film, director Rob King, producer Ben DeWalt and production executive Travis Cloyd, later joined Cage to talk about the approach of the film. Cage’s brother Christopher Coppola, a professor of film studies at the University of San Francisco, also took the stage to discuss the VR technology, its implications and possibilities. Vicki Thompson – Photographer, Silicon Valley Business Journal Cage spoke to acting in this new media, which is still in its infancy. He talked about how actors would need to evolve in the craft in order to move with VR. Not unlike how theatre actors had to do when film came along, and when silent actors had to develop new techniques when the “talkies” hit the scene and everyone was moving toward that. Time will tell what happens with VR technology and how it translates to film. Many believe it is the future of filmmaking; whether it takes over traditional filmmaking and becomes the norm is anyone’s guess. Cage seems to think there could be room for both "It's gonna take a new set of skills [to figure out the new technology]. The Humanity Bureau program will be displayed among others March 1-4 at The California Theatre in the Rehearsal room. Two days down, 11 to go! 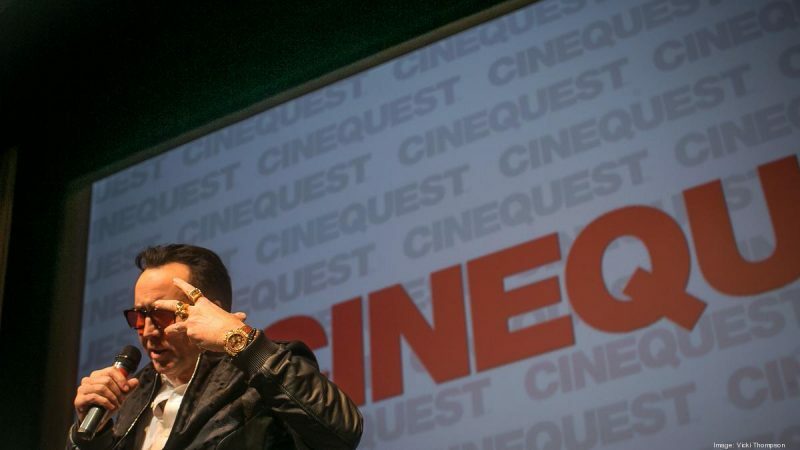 Cinequest runs through Sunday, March 12.